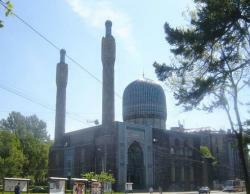 The Mosque is situated on Kronverk Prospect at the Petrogradskaya Side near the Troitsky Bridge. The Mosque is one of the centres of the Moslem Religious Community of St Petersburg. At the beginning of the 20th century the Moslem Religious Community wasn’t numerous. The head of the Community was Mufti Tevkelev. The state permission to build the Mosque was given to him in 1882. All the Moslem population of Rus­sia collected money for the construction of this Mosque. The foundation stone of the Mosque was laid on the 3rd of February 1910. The Mosque was erected between 1910 and 1914. It was designed by the architects Nikolay Vasiliev, Stepan Krichinsky and Alexander Gogen. When St. Petersburg was founded, at the Petrogradskaya Side there was the Tartar settlement. That’s why it was decided to build the Mosque there. The design of the Mosque was based on Middle-Asian Moslem architectural motives. The architectural style of the Mosque is similar to the Tamerlaine mausoleum Gur-Emir in Samarkand. The building of the Mosque repeats many details of the silhouette of that mausoleum. The mausoleum is anoutstanding mon­ument of Oriental architecture. The building of the Mosque is crowned with the huge ribbed dome. In good weather this beautiful turquoise dome can be seen from far away. The architectural en­semble of the Mosque includes two minarets. They are inseparable elements of this ensemble. From these tow­ers the Moslems are called to prayer. These splendid min­arets rise up into the sky. The portals and the dome are decorated with festive tiles forming geometrical orna­ments. The facades of the Mosque are embellished with the citations from the Koran. The Koran is the Moslems’ holy book. The walls of the Mosque are faced with grey granite. They were created under the supervision of the artist of ceramics Pyotr Vaulin. The interior of the Mosque was created according to the traditions of Moslem architecture. The columns are faced with green artificial marble. The citations from the Koran are also engraved on the huge magnificent chan­delier in the centre of the praying hall. The Mosque was opened in 1920. The services were being held in the Mosque for 20 years. Before the Great Patriotic War the Mosque was closed. Only in 1959 the building of the Mosque was returned to the believers. Now the services are held in the Mosque. The Mosque belongs to the Moslem Religious Community of St Pe­tersburg again.